How to impress Interviewers ? There is no direct formula to impress interviewers. But your attitude and some other facts in an interview may impress the interviewers. At the end of day an interview may be considered as an interaction between employers and job seekers. 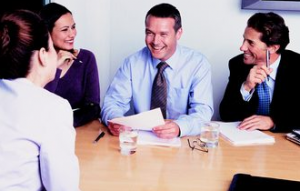 An interview may conduct among many group of people with same qualifications and skill sets. Most of them have performed in a good way, but the in interviewers will choose the candidates with unique qualities like who have been impressed interviewers. At the end of the review your interview, you will get to know where you will connect the recruiters. Be enthusiastic at interview premises:Be enthusiastic and be ready with a smile and handshake. Maintain a pleasant expression and smile on your face throughout the interview and it also elevates your open attitude. Some people may feel nervous about their interview and not able to project their enthusiasm in interview. When you are discussing with interviewers, you voice should project your passion. Do research about the company and ready with some important points about the organization. Ask some questions related to the organization. This will show your interest and enthusiasm towards your job and company. Discuss with interviewer that what you can give:Find out the job profile as much as you can expected to do for your profile. Frame yourself that what you can do for the company and what you are going to do for your profile. It is not necessary to list out the unrelated responsibilities and highlight the related job responsibilities to your profile. Be honest at interview:Dont explain the responsibilities you may not handled which are not genuine and not related to the job profile. Be honest while answering your questions to the recruiters. Show them that you are willing to adopt learning practices and new methodologies if any. Your honesty and sincerity should reflect in your tone and definitely it will make recruiters thumbs up. 0 Comments on How to impress Interviewers ?